Download The Flat Belly Forever Weight Loss Program to discover the corrective nutrition protocol designed to help you lose weight while improving your digestive health and gut bacteria profile. Inside you will find the complete 12 Week Protocol that will lead you down the path to a leaner physique and improved metabolic and digestive system function, not to mention better general overall health. Follow the protocol to lose weight while you improve your beneficial gut bacteria ratio and reap the benefits of easier maintenance once your weight loss is achieved. Say goodbye to yo-yo dieting forever! Our proprietary FBF Nutrition Calculator software will do all the "thinking" for you. Just enter in your measurements and our team of Virtual Nutrition Experts will instantly provide you with weekly food charts, daily calorie recommendations and supplement dosing recommendations to rebalance your gut bacteria. Following these recommendations will create consistent sustainable weight loss. Use the nutrition calculator once per week to check if any of your recommendations have changed. You will find that some weeks it stays the same and other weeks your food choices, supplement dose, and daily calories will change. Inside the Flat Belly Forever 12 Week Workout program you will find an easy to follow full body resistance training program designed to aid you in your fat loss process and help you build new muscle. Complete with clearly laid out instructions and a video tutorial Exercise Gallery, the FBF workout program is designed around the latest research surrounding exercise and gut bacteria health to enhance and compliment the FBF nutrition protocol. The FBF Exercise Gallery is a comprehensive video tutorial demonstration library designed for use alongside the FBF 12 Week Workout program. Featuring program designer and expert trainer John Barban, each video includes verbal exercise technique and form instruction along with visual demonstrations of each exercise you will encounter while following the workout program. The Prebiotic Cookbook features enjoyable gourmet fat burning and gut friendly meals you can use along with the FBF protocols or after you have completed the program to keep your gut health in tip-top shape. This unique and one of a kind cookbook has been developed using research that reveals what Flat Belly Forever members consider the most flavorful metabolism boosting foods in the program to design delicious mouthwatering recipes that are packed with healthy, gut balancing, fat burning PREBIOTICS. Inside this creative cookbook are 111 recipes including breakfast, lunch, dinner, dessert, snacks and cocktails that promote a healthy gut bacteria profile, the efficient fat burning and long term weight loss you want. Inside the FBF Final Phase system you'll discover the advanced nutritional techniques necessary to ensure that you don't experience the rebound weight gain that happens with every other diet. The FBF Final Phase system also features a 9 week advanced workout program uniquely designed to eliminate soft problem areas and cellulite while working with your new metabolism to tighten, tone and sculpt your new leaner, lighter body towards your ideal shape. 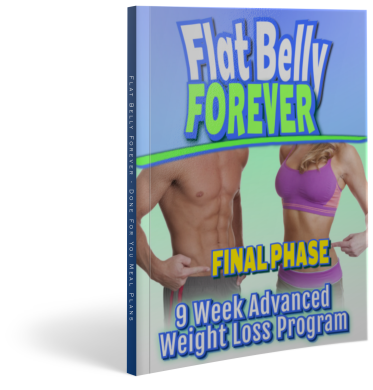 You can expect the Flat Belly Forever Final Phase to help you dial in, refine and perfect everything you've accomplished in your first 12 weeks and take you all the way across the finish line. So lock in your weight loss and eliminate your problem areas while enjoying all of your favorite foods. The FBF Done for You Meal Plans take all the guess work out of designing a nutritional strategy and recipes that will comply with each phase of the FBF rebalancing protocol. To make your life easier, we've created a full 12 weeks worth of completely DONE FOR YOU meal plans that take all the thought and work out of putting your meals together. If you want us to do everything for you, save you a ton of time, and put together the best tasting, money saving meals that are far better than you could EVER put together yourself just select the option below... because this is for you.